Argan Dew Hair Mask/Oil Review – 20% Discount Code! Hi everyone! I was fortunate enough to receive samples of the Replenishing Hair Mask and the Miraculous Argan Oil from a company called Argan Dew. This company prides themselves on 100% natural hydration due to the mixture of Moroccan argon oil with other organic plant oils. Argan Oil has really taken over the world of hair-care and I normally style my hair with a few drops of Argan Oil, so I thought it would be a good idea to try out a hair treatment and I was pleasantly surprised! The packaging is simple, sleek and classy. The sachets of product come in a small card with some history of Argan Oil and it’s uses. On the back of the cards, we have the Argan Dew website and also the other products that the company has to offer e.g: Miraculous Argan Oil, Intensive Replenishing Hair Mask, Restorative Hair Treatment, Lustrous Conditioner and Enriching Shampoo. The cards remind me of opening a birthday card with a present inside! When using the Replenishing Hair Mask we are told to wash the hair and then apply the mask while the hair is wet. You then leave the mask in and after 5 minutes, wash it out. This hair treatment was DEFINITELY the best product out of the two, as it left the hair silky smooth and soft, without that greasy feeling. I constantly have straw-like dry hair when it has just been washed so this product definitely got the thumbs up from me. The Miraculous Argan Oil however, I felt was too “oily” for my liking. This product would best be used on its own as I used it straight after the Replenishing Hair Treatment which is maybe why my hair was left feeling too shiny and greasy. The oil can be used on wet or dry hair and can also be used before or after styling which is a plus. The oil smells amazing and fruity unlike many other oils which have no smell whatsoever. I hope you enjoyed this quick review and also I was lucky enough to receive a code for 20% OFF! To receive your discount follow this link to the Argan Dew website: http://goo.gl/YrqlLp and enter the code argandew. Please subscribe to my blog and I’d love to connect with you guys on my social media or in the comments below! You receive a cool white box with the doll white logo across it and on the back are instructions for use and a disclaimer and contact details for the company. When you open the box you find black sachets (with the doll white logo) that contain the pairs of whitening strips. Upon opening you are presented with a clear plastic sheet with clear gel like strips, one for the upper and one for the lower teeth. I like how the strips are different shaped to mould to the contours of the gums. The gel strip goes on easily to the teeth however it soon starts hardening and can be uncomfortable to some. Also the mint flavouring is very minimal if any. The box says to leave the strips on for 30 mins which is a reasonably long time however it is a good idea to put these on first thing in a morning so that you are occupied enough to pass time. You then dispose of the strips and rinse your mouth. 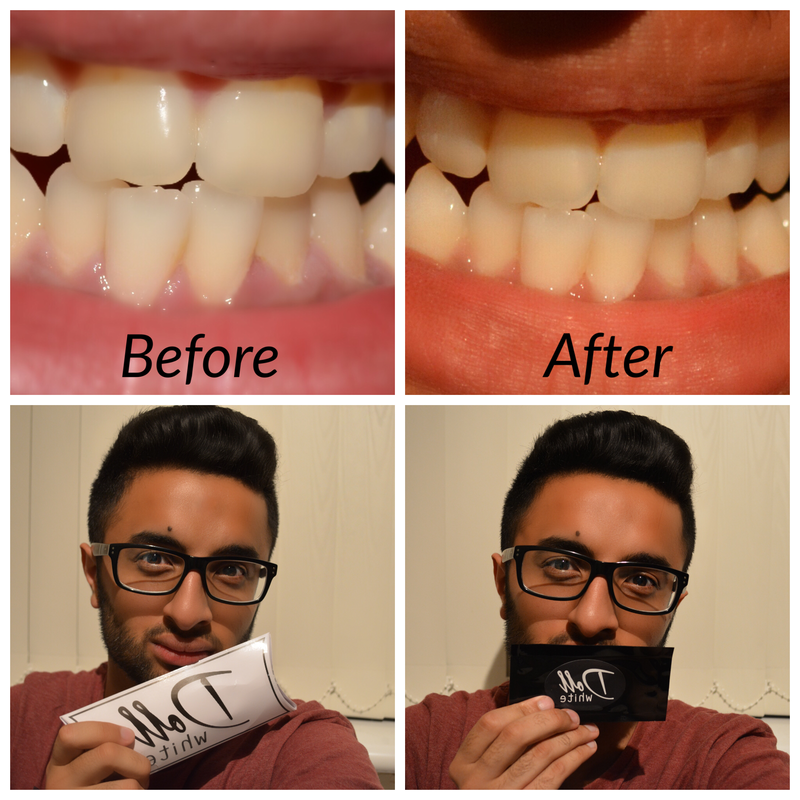 After 7 days, I have to say the effects, were mediocre… My teeth were whiter straight after using the strips compared to the overall 7 day effect. In the long term, these strips are good for reducing stains from coffee etc. I would definitely recommend these whitening strips for an event e.g. prom or a wedding but in the long term I would prefer something stronger. Thank-you for lasting through the whole blog post and head over to www.dollwhite.com to see what other amazing products they have to offer. I would love to hear your thoughts and comments down below. Please don’t forget to subscribe!